My boys and I really enjoyed screening Teen Titans Go! to the Movies. I was unfamiliar with these characters so I wasn’t sure what I would think, but I found myself having a great time. The music is awesome and the laughs just keep coming! My boys are older 14 and 12, but they still had a blast watching this story unfold. It taught them a good lesson: You are never too old for fun! You can read my review HERE. The Giveaway: OVER WINNER: Casey G Congrats! I have one copy of Teen Titans Go! to the Movies on Blu-ray to giveaway to one of my readers! Entry is easy! Must be 18 and over and reside in the US. Giveaway ends Nov 2, 2018. One winner per household. My nephew loves this show. I would love to win so I can give this to him as a Christmas present. He saw it in theaters and enjoyed it. i would love this, I’m a comics nerd , but missed this movie. I want in to win the Teen Titans Go! I want to win this for my 6 year old son. I would love to win & watch it with my kids! Thanks for the chance. My kids absolutely love this and would love to watch this movie! I would love to win this movie. We missed seeing this in the theater my son would LOVE to see this! I want it! 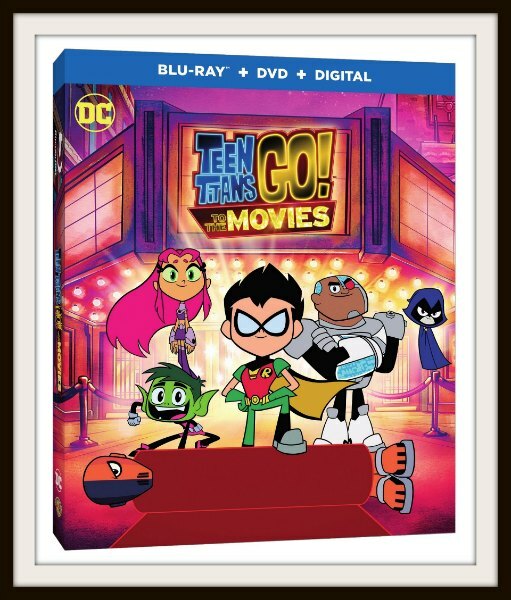 I’d love to win…my kids love Teen Titans! My family loves watching Teen Titans together and we all really want to see this movie. I would love to win this!!! My grandson would love it! I’d love to own this movie! I would love to win! My grandsons would enjoy watching this movie!